A Summer to Remember Contest is presented by Nebraska Furniture Mart. The Contest is for the legal United States residents and for those who are 18 years of age (19 in Nebraska) or older at the time of entry. The Contest began on 16th May, 2018 and ends on 5th June, 2018. The Prize for the contest winner is A Husqvarna Automower, Weber Grill and 4 Seasons Global Patio Set. The winner will be selected on or after 6th June, 2018 from the eligible entries received in the contest period. By entering, participants are agreeing to be bound by the official rules and the decisions of Nebraska Furniture Mart. If there is more than one name in any entry form, then the persons listed there will have to submit a single entry jointly and receive the award in the form of co-owners. Eligibility: Open only for those who are the residents of United States and who are 18 years of age (19 in Nebraska) or older at the time of entry. 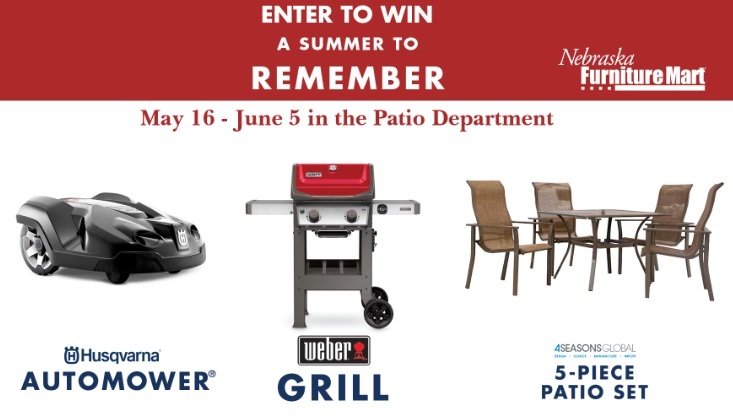 Prize (s): A Husqvarna Automower or A Weber Grill and 4 Seasons Global Patio Set.